I'm now puzzled however that this is being marketed as a comedy. It's not. It's a family drama with some occasional witty, ironic humor. Funny, you should object to the comedy label, because the almost sitcom-like shenanigans of the film bothered me initially and it took me a while to warm up to them. When I saw the film, I wasn't yet aware of the marketing; I came to it because I liked Lisa Cholodenko's previous work. Overall, I liked the film much better than you did, but it certainly is her weakest film to date. I didn't have a problem with that. First, if you look at modern "queer" cinema, sexual identity is generally treated more fluid. See for example Gregg Araki, Xavier Dolan, or even Lisa Cholodenko's earlier films. Second, Jules' fling with Paul comes out of a specific situation where she is very vulnerable and he is the one available. It's something that happens; the film is personal, not a political statement or an ad campaign for homosexual relationships. Good to see you dusting off the old thread, James! Points well taken. Thanks, Matthias. Gloria Wondrous awakens in a luxurious bedroom that's not hers. She swallows a jolt of distilled courage, tosses aside $250 left by an admirer, leaves a scornful reply in lipstick on the mirror, dials her service for messages and slips into a mink coat she finds in a closet. The day and the movie are off to a roaring start. Moviegoers and Hollywood left a message of "Hurrah!" 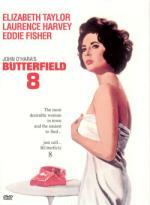 for Elizabeth Taylor and Butterfield 8. Audiences made the film, co-starring Laurence Harvey and Eddie Fisher as a married lover and platonic friend who matter to Gloria, a box-office hit. And Taylor won her first Best Actress Academy Award® as the call girl whose life comes with a complete set of emotional baggage. For a glossy, good time, don't call. Watch. This is Elizabeth Taylor's first Oscar-winning performance. It's a real soaper! In spite of that, it's a tour de force for Taylor and a real culmination of her career to that point. After a 3-year break, she would then make Cleopatra, launching herself into mega-stardom with Richard Burton. I thought she did a great job in this role. It was easy to see why she won the Oscar. She's independent and strong, yet wants to be treated like a lady. She's a man-killer but can't seem to win one guy to be hers. The soap opera aspect is where the problems lie, in my opinion. It's one of those movies where characters feel compelled to do exactly the worst possible thing in any given situation. Laurence Harvey is good as the distant adulterer that no one can seems to keep as theirs. I was surprised by how good Eddie Fisher was in his role. I wonder why he didn't make more movies. Dina Merrill was good as the cheated-on wife, although her over-dramatics caused me to laugh at one point where I shouldn't have. It's that soap thing again. All in all, I really enjoyed it. 3 on the cellophane scale. The wealthy, self-absorbed eccentric Sissy Goforth has taken up residence on a secluded Mediterranean island where she dictates her memoirs, flies into rages and screams insults at her servants. Her health now failing, she drinks, takes pills and has a doctor give her injections to ease the pain. Into her reclusive life comes a stranger who manages to climb into her villa and survive a guard dog attack before introducing himself as a poet. Though attracted by the visitor she soon discovers he has a reputation for appearing when wealthy women are about to meet their demise and is known locally as the Angel of Death. Oh, my. Is this "so bad, it's good" or "so bad". I watched it from beginning to end. It's gorgeously shot by Douglas Slocombe (Oscar-nominated for Travels with My Aunt, Julia and Raiders of the Lost Ark) The design by Richard MacDonald is stunning: really creative murals, settings, devices (the gondola ride). The costumes by Annalisa Nasalli-Rocca are incredible. The kabuki outfit that Liz wears for dinner with Noël Coward is unforgettable. Speaking of Noël Coward, he eats up the scenery as only he can...although his "mating calls" (as I refer to them) with Elizabeth Taylor are awkward. Richard Burton seems grounded in his role, although it's actually a supporting role, in my opinion. The star, as if there could be any other, is Elizabeth Taylor. She's at the top of her game here, wringing every last drop of emotion and hitting all of the style points. She's shrill as a shrill character. And that's where we run into problems. She's the focal point of the film and completely intolerable or likable as a character. On the plus side, her Krupp diamond ring is often featured as are her beautiful eyes. I don't even know what the director, Joseph Losey, was up to. I suspect he didn't care for some reason. The script is just such a mess. It's a real shame since the actors and other crew (cinematography, design) are so great. But in the end, sadly, it's garbage. I wonder if playing annoying, unsympathetic characters such as here is what effectively killed Elizabeth Taylor's post-Virginia Woolf career. With apologies to Elizabeth Taylor: 0 on the cellophane scale.